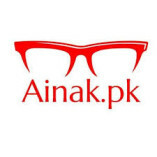 Ainak.pk was founded in 2010 with a mission to deliver premium optical products. Our main focus is on providing the best prices in the market while quality remains the substandard objective. We deal in all types of optical products that include... eyeglasses, sunglasses, contact lenses, optical frames, power lenses, and power sunglasses.